While Donald Trump remains steadfast in his plan to build a wall along the US-Mexican border, Mexico’s new president wants fewer of his countrymen and women to feel the need to emigrate in the first place. To help achieve this, Andrés Manuel López Obrador has started a new initiative to boost the economies of towns and cities along the Mexican side of the border. The hope is that businesses will grow and employ more people, increasing prosperity. But what are the details of the new “zona libre” or free zone scheme, and will it work? It is noon at the Hotel La Villa de Zaragoza in downtown Tijuana, the Mexican city directly across the border from California’s San Diego. Chef Gerardo Santos Gonzales and waitress Patricia Olvera Martinez are swinging into their well practiced lunch service routine. He is dry frying some oregano in a pan over a gas flame, while she takes the first orders in the restaurant. The scent of the herb adds to the already wonderful smells of freshly made salsas and tortillas. The free zone scheme was introduced last month after President López Obrador announced it at the end of last year. 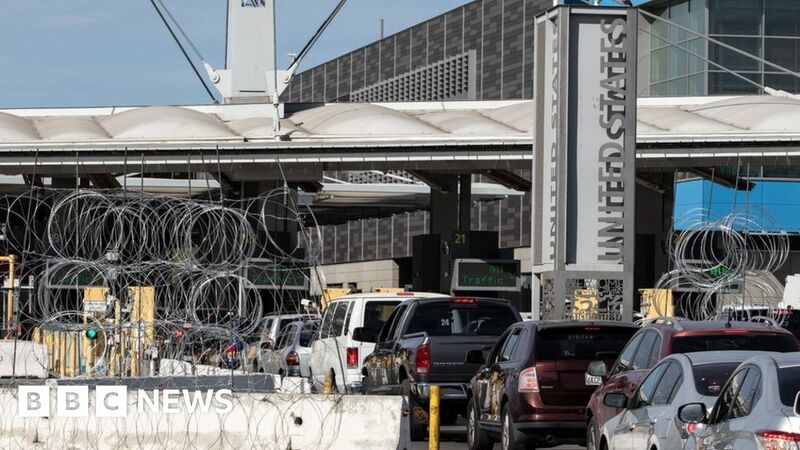 Running the entire length of the 3,180km (1,954 mile) US-Mexican border, and 25km wide, the sales tax inside the area has been halved from 16% to 8%. At the same time, income taxes have been cut from 30% to 20%, and the minimum wage has been doubled to 176.20 pesos ($9.24; £7.12) per day. In addition, fuel prices in the zone have been reduced to the same level as in the US. President López Obrador, who is left-wing, hopes that in addition to reducing emigration to the US, the initiative will encourage more American companies to invest in Mexican firms, and therefore boost cross-border trade ties. “It is a very important project for winning investment, creating jobs, and taking advantage of the economic strength of the US, ” he said. Adrián Valdés, a young businessman in Tijuana, says he is hopeful that the scheme will indeed give companies in the border area a boost. “Right now we import many finished goods, and we’re not producing to our potential,” he says. Mr Valdés, who runs his own business advising companies on how to reduce their environmental impact, adds that it is vital that more knowledge, talent and production is kept on the Mexican side of the border. The free zone scheme follows after a new trade deal between Mexico, the US and Canada was signed in November. Nikia Clarke, from the San Diego Regional Economic Development Corporation, says that the new initiative by the Mexican government brings “additional clarity about cross-border production in the US/Mexico relationship”. However she cautions that it is as yet unclear “how the increase in the minimum wage will impact the bottom line of a lot of firms that are operating south of the border who might have gone there for cost reasons, or, whether the income tax cut will temper that”. At any rate, Ms Clarke says that “good strong economic development along the border region is good for Mexico – so in the long run it probably does help with some of the migration challenges, and in that way it’s good for the US too”. Among the wider Mexican business community there is also concern about the doubling of the minimum wage within the border zone. Carlos Castañeda leads the local chamber of commerce, or “Canaco” in Ciudad Juarez, which is across the Rio Grande river from the Texan city of El Paso. He is fearful that the salary issue will now become “a struggle between a business and its employees”. Other Mexican business leaders have expressed concern that companies in other parts of the country will relocate to the border area, harming the area that they leave behind. Back at the Hotel La Villa de Zaragoza waitress Patricia says the reduction in the rate of sales tax will be particularly helpful. “Being able to buy most things more cheaply will make life easier,” she says. She also hopes that the scheme will create work for members of the so-called migrant caravan – migrants from Honduras, Guatemala, and El Salvador who have arrived in Tijuana and other border towns and cities with the hope of entering the US. Patricia says they are very welcome to stay in Tijuana if they are willing to work and contribute to its economy. Whether the free zone is successful remains to be seen, but it is too late for some of Patricia and chef Gerardo’s respective children. Both say that they have kids who moved – legally – to the US in search of a better life.